A new widget was added to NextCharts html5 library: Display. "Display" shows a value (without min/max boundaries like those used for Indicator) which is associated with a period of time. You can think as example for: Number of site visitors per day, Interest Rate per month, Profit per year.Although, this widget has the possibility to show how this value performed regarding a previous value (on previous period of time). - shouldRise: true to indicate that a rise in value is a good thing, false to indicate that a lower value is a good thing. 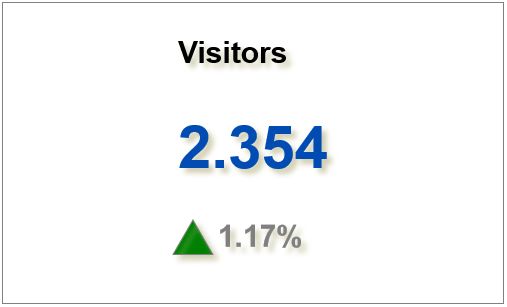 For example: a rising number of visitors is good, a lower value of bounce rate is good. Depending on last two properties we can have a green or a read arrow if the value evolves in the "good" direction or not.